Reconnaissante, la population de la Ville de Grande-Rivière rend hommage à tous ses pionniers dont le courage et la volonté ont conduit, en 1697, à l'établissement d'une seigneurie octroyée à Jacques Cochu, devenue un village pittoresque aujourd'hui, une prospère ville de services. 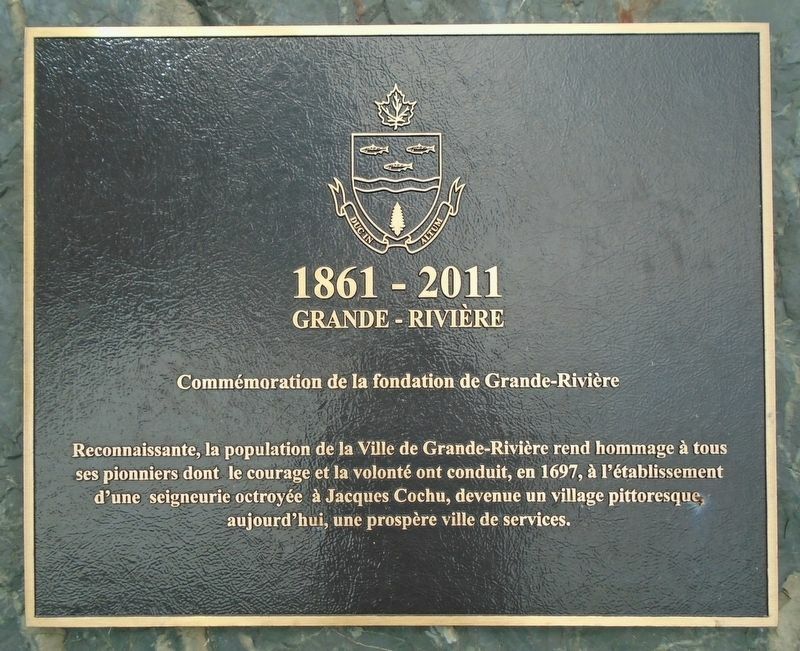 Grateful, the people of the City of Grande-Rivière pay tribute to all its pioneers whose courage and will led, in 1697, to the establishment of a seigneury granted to Jacques Cochu, now a picturesque village, a prosperous city of services. Erected 2011 by les gens de la ville de Grande-Rivière. Location. 48° 23.891′ N, 64° 29.916′ W. Marker is in Grande-Rivière, Quebec, in Le Rocher-Percé MRC. Marker is at the intersection of Grande Allée Est (Quebec Route 132) and rue du Carrefour, on the right when traveling west on Grande Allée Est. Touch for map. Marker is at or near this postal address: 84 Grande Allée Est, Grande-Rivière, Quebec G0C 1V0, Canada. Touch for directions. of this marker. 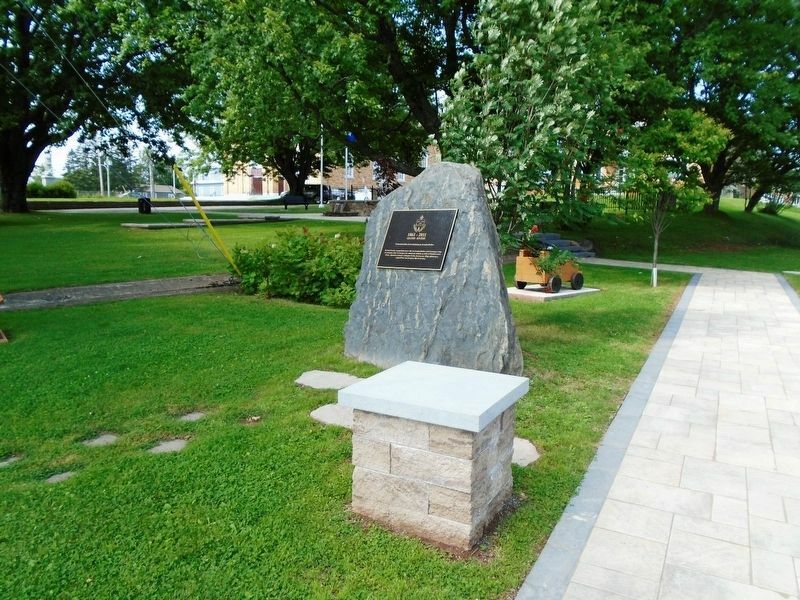 War Memorial (within shouting distance of this marker); Vétérans et membres des Forces armées canadiennes (within shouting distance of this marker). More. Search the internet for Commémoration de la fondation de Grande-Rivière. Credits. This page was last revised on February 13, 2019. This page originally submitted on February 13, 2019, by William Fischer, Jr. of Scranton, Pennsylvania. This page has been viewed 36 times since then. Photos: 1, 2. submitted on February 13, 2019, by William Fischer, Jr. of Scranton, Pennsylvania.